Subscribe to our newsletter to receive by email the last news of the Asinerie du Bocage. The advices I will give you on this page is my opinion. They come from 20 years of observations and experience in breeding donkeys which has also allowed me to successfully give advice to other owners. Education is more effective with a foal (who is approximately six months of age). How can you obtain a good relationship with your animal? What can you do to help it to have confidence in you? How can you manipulate its limbs? How can you walk with your donkey? A -How can you obtain a good relationship with your animal? It will be easier if you isolate it from the herd, if you have several donkeys. 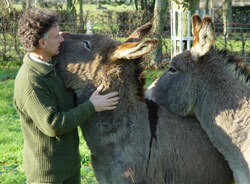 Your donkey must always want to come to you as soon as it see you in its pasture, to have tenderness and affection. Careful, this first contact with your foal has to be done without inducement of food; you must reach that point naturally. If you need food to approach your animal or to catch it, you are in a position of failure, without forgetting all the risks which this method can involve. If your foal hesitates to approach, you can lie down to reassure it. I reject on the fact that the donkey is stubborn like it can be describe in stories. On the other hand, it can be very mistrustful, which can be a quality, but is not timorous. © Copyright Asinerie du Bocage - All rights reserved.